5. Channel: 9 /11CH . Worldwide Power Cord (USA, EUR, UK, AU ) Type, It's with the US plug, if you need others, please contact us. We will ship you the Plug converter you need. Warranty: 2 Years; Power Supply: AC100-240V, 50-60Hz; Power Consumption: 30W; Light Source: 1pcs*12W LUMINUS LED white; Dimming: 0-100%, 5 selectable Dim Curves. DMX Channel: 9/11; Linkable: DMX via 3-pin XLP cable; Beam Angle: 13°; Rotation Angle: 3-facet prism, bi-directionally rotating at variable speed; LED Lifespan: Rated at approximately 50000 hrs. Gobo wheel: 7 fixed gobos + spot, Gobo Shake effect, Gobo scroll mode; Color Wheel: 7colors + white; Focus:Manual focus. 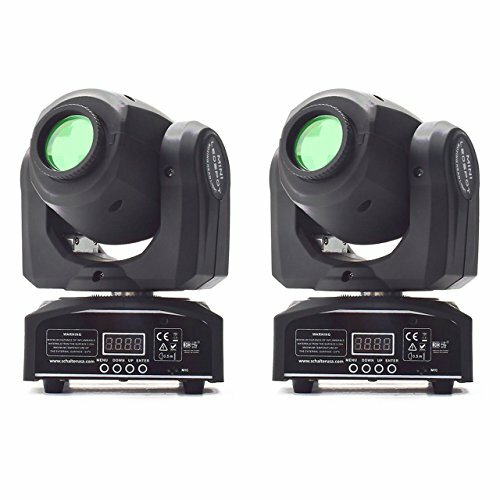 Control mode: DMX512, master-slave and sound activated, controllable or auto operation; Shutter: Pluse effect; random strobe slow to fast. Rich color great for Club, Dj show, Home party, Ballroom, Bands, Show bar etc. Dimensions(L*W*H): 159 * 147 * 265 mm; Net Weight: 3KG; Gross Weight: 3.5KG.